Here are my thoughts on some of my recent non-fiction reads. I love the Game Change movie. I can watch that over and over again, it is one of those cannot flick past movies for me. I had never read the book before. The book actually talks more about the Obama and Clinton campaigns than the McCain/Palin campaign. This was a fascinating read, especially now with the US election stuff in full swing. Imagine your child is kidnapped and murdered. Imagine that a criminal confesses to the crime, but recants, then confesses, then recants. Imagine that the vehicle the criminal was driving at the time is found and fully examined forensically. Imagine 5 rolls of film are taken of various things. Imagine those rolls of film never being developed. Several years later, they are developed, and all the proof anyone ever needed to say “yes, that criminal committed this crime” is right there on the film. This book provides a troubling insight into how NOT to be a homicide detective. You may have heard of the case because the father of this missing child went on to become the host of America’s Most Wanted – his name is John Walsh. What can one say about this book? 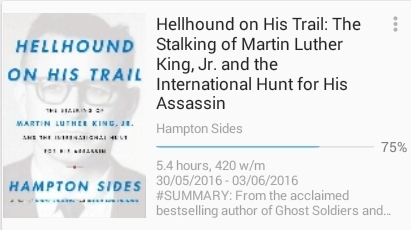 If you know nothing about the assassination of Martin Luther King, this is the best starting place to find out, well, pretty much everything. Incredibly well researched and beautifully written. It turned out everything I had ever heard about Columbine was wrong. That might be the case for most people. I do recommend this book so you can know what really happened. I love to read books. I have always loved to read books since I was a child. As a teenager many nights when I would be told to go to bed, I would go with a book and read until 2am or so. A tablet full of books is a blessing – and a curse. In the old days one had to get out of their warm bed and go to the book room to select another book to read, if one finished ones book. Now, one can just flick through a file menu and pick another book to read. The blessing is that my tablet can hold thousands of books. A virtual library! But even virtual libraries can become difficult to navigate. At some point last year, I tried to sort out the books on my tablet and lost an entire directory of true crime books in the process. No problem, I have a backup of all the files on the server.. But there was a problem, because those files are all together in big directories sorted by file type. I have 5711 epub files. I have 8268 mobi files. I have 2,361 pdf files. To find those true crime books again I had to pick through each directory, book by book. Some of them were pretty obvious by the title, others not so much. This is why a lot of my recent reads have been true crime books. I use Moonreader on my tablet. 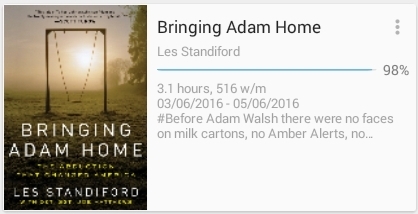 I love being able to see how long I spent reading a certain book and at what speed I read it, though the speed is slightly affected by my habit of using my tablet as a light when I need to go to the bathroom. It is cumulative, too. Because all these books were just added back onto the reader, these numbers are for one read only. If I read the book again, it adds the time I spend reading the book onto these numbers. Since I installed Moonreader, I have spent 49.5 hours reading my trusty reliable Mansfield Park. That is the book I turn to when I have to get to sleep early, that night. 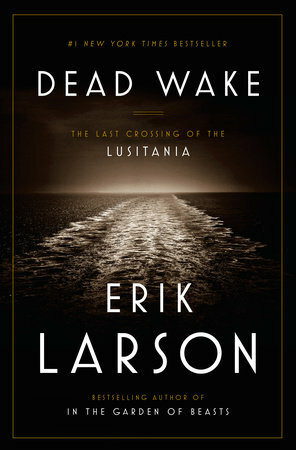 Snoskred was provided with a free copy of Dead Wake by Erik Larson from the website Blogging for Books which provides review copies of books to bloggers, retailers, librarians, and media outlets in exchange for an honest review. 100 years ago today, on the 1st of May 1915, RMS Lusitania left New York on her way to Liverpool. She never arrived. On the 7th of May 1915, the ship was torpedoed by a German U-Boat and sank completely within 30 minutes. Only six of the 48 lifeboats were able to launch. Of the 1,962 people aboard, 1,193 died when the boat sank. Four more died later from injuries inflicted during the sinking. This was a terrible tragedy. I personally consider such an act to be mass murder and a war crime of immense significance. You might have heard in recent days about the SBS sports reporter being sacked for making some quite offensive tweets on Anzac Day here in Australia. While I do not agree with any of the things that journalist said, one tiny part of his tweets rang true purely because I had just finished reading this book. I will repeat just that part of the tweet and not the offensive first part. pause today to consider the horror that all mankind suffered. I think considering the horror of war and what our ancestors went through is something we do not do as often as we should. Books like Dead Wake are extremely important because they allow us to explore events that happened during war and to understand just how horrible those events were. Mankind did suffer. Mankind will always suffer during any war. It is important that we know this, and that we remember this. This is a vast story with an enormous amount of people involved. Erik Larson has done an excellent job with this book to wrangle such an epic historical event into just one book and weave multiple story threads into a compelling tapestry. I suspect that an author could easily write multiple books about various aspects of the sinking of the Lusitania without being short of material for any of them – you could have one about the boat itself and the people on board, a book about the U-boat and Germany overall, a book about the code breakers and the UK government, a book about the political situation in the USA. There are so many threads to this story – and this brings me to the one negative I felt about this book. Sometimes I felt like the jumping back and forth between the different story threads made the story a little more difficult to follow.. In particular the focus on President Woodrow Wilson – while interesting – felt somewhat jarring to me. I felt like that story thread could have been cut back or even trimmed out of the book entirely, which would have allowed the other threads to knit together more closely. I could perhaps understand the inclusion of that thread had the sinking of the Lusitania caused America to join the war, but that did not happen. There are two sections in the book which walk a very fine line between poignant and upsetting and it depends on the reader where they will draw that line. The author describes photographs taken of the dead to help with identification and the descriptions he gives paints the pictures better than any viewing of such images could do. There is also a description of an autopsy. I found these details relevant to the story being told. I can understand not everyone might feel that way. As always I am deeply grateful no such images found their way into the book itself, but I do appreciate the author having viewed them and if I were writing a book of this magnitude I would probably want to do the same myself. I personally find those kind of images difficult to remove from my mind but I can handle a description. I was looking forward to reading this book and it did not disappoint. As a reader I appreciated the detailed look at what it was like for passengers and crew alike to undertake the journey from US to UK via ship back in the days when planes were purely for short journeys and daredevils. Then the book would transport me to the U-boat which was responsible for firing the torpedo that sank her and allow me to understand what life was like for the crew on such a submarine. I will certainly seek out other books by Erik Larsen. In particular I will hunt down two books – The Devil in the White City which tells the story of the first serial killer in the US – Leonardo Dicaprio purchased the film rights to this book. Tom Hanks bought the film rights to In the Garden of Beasts. Both films are presently in development according to IMDB. If you want to read Dead Wake, here are my suggestions – This is quite a long story however because of the multiple story threads and the fact that I knew a little about the story when I started the book, I found it easier to put the book down when my alloted reading time for the day was over. I read this book over the space of a week, spending an hour and a half to two hours reading each night. However please do keep in mind, I am a fast reader. Snoskred rating – 10 out of 10 – Must Read. So, two books reviewed, both of them have been spectacular reads. Either I am an excellent chooser of books, or there are a lot of high quality tomes being published at present. I suspect it might be the latter. You can read my review of Trapped Under the Sea by Neil Swidey here. Don’t forget, you can view my disclosure policy here. All opinions and thoughts are my own and will always reflect my own experience – positive, negative, or in-between. I received this book from Blogging for Books for this review. You too can sign up to review books via Blogging for Books. Snoskred was provided with a free copy of Trapped Under the Sea by Neil Swidey from the website Blogging for Books which provides review copies of books to bloggers, retailers, librarians, and media outlets in exchange for an honest review. 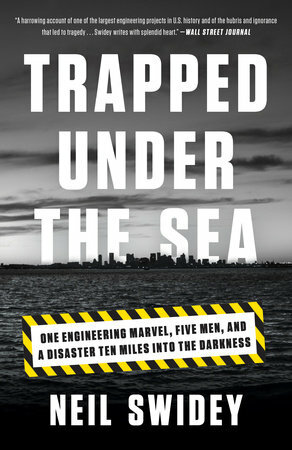 Trapped Under the Sea is the harrowing story of five men who were sent into a dark, airless, miles-long tunnel, hundreds of feet below the ocean, to do a nearly impossible job – with deadly results. At the respectable bedtime of 10:30 on a Friday night, I snuggled in to bed and began to read.. somehow I got sucked into that temporal vortex that happens with truly excellent writing. This was not helped by the fact that the Kindle reader app hides the time – my normal reading app Moonreader gives me the time in the bottom corner – and the fact that I did not have to get up by any particular time on Saturday..
As I lay there in the dark pondering what I had just read, a quote from my favourite Stephen King book The Dead Zone popped up in my mind. The divers who were chosen to undertake this very difficult task were all 3 percent people – they were people who did what they say they can do. They had long personal histories of doing difficult jobs in tricky situations. In this situation, they were not underwater but they were deep in a dead-end tunnel that had no air supply, so they had to bring their own air with them. It is vastly unfortunate that the person tasked with putting together their air supply was not one of those people who *can* do what they say they can do.. if anything, in my personal opinion he was in the one percent that are *not* saints. He claimed he could put a safe air supply together but it was cobbled together with plywood, duct tape, air from liquid nitrogen and oxygen bottles and being mixed using a mixer not intended for the purpose it was being used for. There was absolutely zero testing of the system he created. This ended up costing people their lives, while he sat safely above ground. The book also tells the history of the tunnel project, examines the people in charge of the project and the relationships with companies and personalities involved. It describes the investigation and tells the story of exactly what went wrong, also making clear what could have been done to prevent these deaths. It then leaves the reader to judge what level of responsibility those involved in the project have in the deaths of these workers. I’m not going to tell you any more of the story, because I think you should read it for yourself. I will say that Neil Swidey seems to be some kind of writing magician. In this book, things that appear to be mundane details are somehow not mundane, rather they are gripping and mesmerizing. Complex concepts are communicated simply and clearly. Contract struggles, which would be boring in the hands of most people, are somehow transformed into fascinating essays. The only tiny negative I could find – there were some great drawings in the book which explained concepts which had been described in writing before the drawing appeared. I felt that I would have understood the written explanation better if I had seen the drawing first, when I saw the drawing it was like “Oh, now I get it!” and I did actually go back to read the explanation a second time once I did see the drawing. But this is a tiny nitpick, it might be me rather than any fault of the book or the writing and it is also possible that the drawings appear in a different place in the actual book than they do in the e-book. I was extremely lucky to pick such a captivating and beautifully written book as my first read from Blogging for Books. I do hope I will have that kind of luck again on a regular basis. With that said, this book was so excellent that *any* book I read for a while is going to seem mediocre. You can grab a copy of the book on Kindle via Amazon here – the website for the book is here. There is also this great page – Behind the Book – which you can read with a little more info, some photos, and some links to interviews. Plus, there is this video. The first thing I did when I woke up the next day was to seek out what other books had been written by Neil Swidey – and despite the fact that I am not a sports fan, I am quite determined to get my hands on The Assist via my Kindle account. I truly enjoyed reading this book. I think this is an important story that workers and employers should read, if only to make people stop and think of the possible implications of the things they do at work, whether those things are safe, and whether the people above you truly have your back when it comes to occupational health and safety in the workplace. In Australia, over 180 people die at work every year. If you want to read it yourself, here are my suggestions – It is unlikely that you will want to stop reading once you start reading this book, so I suggest pick a time when you do not have any fixed commitments for the next 6-24 hours, depending on how fast you read.. People have told me all my life that I am a fast reader and that is probably true, so if you are not a fast reader give yourself more of a buffer zone. You too can sign up to review books via Blogging for Books. I’d really love it if you did. Book reviews are something I never get tired of reading and some of the best gems I have found have been thanks to fellow bloggers who took the time to read the book and then write about it.